Cassie Freund is a tropical forest ecologist and a third-year Ph.D. student at Wake Forest. She currently studies the disturbance ecology of tropical montane forests. Her work is important for understanding the structure, composition, and functioning of these dynamic forest ecosystems. Q: What did you study as an undergrad at Wake Forest? A: I majored in Biology with minors in Environmental Studies and English. Q: Have you always been interested in Environmental issues? A: I was involved with the Student Environmental Action Coalition as an undergraduate student here and when I was a Junior the Office of Sustainability was formed on campus. A: Yes, so I work with Dr. Miles Silman whose long-term research focuses on the different forest communities all along the Andes but my research focuses on the mountain range and disturbances. So things like landslides on the mountains and how they affect the forests. We don’t know very much about landslides but they are the most common type of disturbance in the mountains. Yet there is so little researched about them. So I call myself a community ecologist but all of my research is focused on forest ecology. 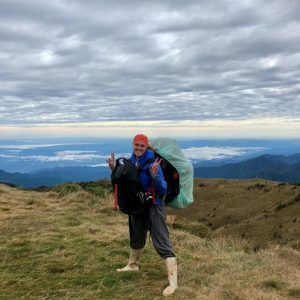 Freund stops for a photo at a research transect 3600m above sea level in Tres Cruces, an area in Peru’s Manu National Park. She is prepared to hike down the trail and set up camp where she will conduct research for two weeks. A: It’s hard. In focusing on disturbances you have to go out and find them so we go out into the forests to look for landslides which is not necessarily easy. The past few summers I have gone to Peru along this 9-10 mile long trail and we camp out for a couple of weeks at a time and everyday we find landslides and collect data on them. One new thing this past summer was the use of drones to help find the landslides. Q: How often do you got to Peru? A: I have been to Peru the past two summers for research and I will probably only go one more time this upcoming summer. It is interesting to be here teaching for nine months of the year and then everything happens so quickly with my research in the three months of the summer. Q: How did you become interested in forest ecology? A: After I finished undergrad at Wake, I got my masters at Columbia. There is a program there for conservation biology and I just happened to partner with a PhD student there who was studying forests in Indonesia and so by taking this opportunity out of nowhere I became interested in forest ecology. Q: What part of forest ecology interests you the most? A: I am really interested in conservation. For me, and this is not true for every person, but the purpose for doing research is to then use your research to make a difference for conservation. So I hope that my research will be useful in the national park we work in and other forests in other countries around the world. To learn more about Cassie Freund’s research, you can check it out here and read her published work here.